Come out and enjoy a day at the Long Sault Ridge Runners Snowmobile Club for there Show & Shine and Demo Day. 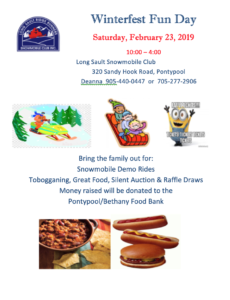 Bring out your antique sleds to show them off or try out the 2019 snowmobiles provided by our local dealers on a private groomed track. We’ll have a smaller track for all the kids to ride there miniature sleds on also. Lunch will be available for purchase along with our raffle and auction.